How are all the hearing aid manufacturers, brands, and retail outlets related? What are the best hearing aids for 2019? Let’s take a stab at that first question, before moving onto a more comprehensive look at the major manufacturers and brands in the industry. This is a very difficult question as there is currently no objective way to assess the quality of one hearing aid over another (more on hearing aid reviews). However, many audiologists accept that the quality of hearing aids coming from the “Big Five” hearing aid manufacturers is high standard, and that you generally can’t go wrong by sticking with the industry’s top brands. So who are the “Big Five” hearing aid companies, what countries are they from, and what products do they produce? What happened to the “Big Six” hearing aid companies? On of March 1, 2019, Widex and Sivantos merged together to create WS Audiology. The merged company, with dual headquarters in Denmark and Singapore, is now the third-largest supplier in an industry where only five companies currently command more than 80% of the global market for hearing aids. Widex and Signia hearing aids will continue as the flagship brands of the merged company. WS Audiology also manufactures Rexton hearing aids. Your hearing loss severity - You need a hearing aid that is capable of providing adequate amplification. If you have a severe or profound hearing loss, you’ll need a device that can produce higher sound levels. Your ability to hear speech in noise - Speech in noise testing should be performed at every hearing evaluation. If you perform well on the test with amplification, hearing aids are likely to help you in noisy environments. Brand accessibility - Certain brands may not be accessible in your area. This may limit your options. Important features - Your hearing professional should get to know your listening needs and goals and suggest hearing aid features that can give you the most satisfaction and benefit. Your lifestyle - More advanced hearing aids are geared towards meeting the needs of those with the most active lifestyles. If you find yourself in more complex listening environments you should consider purchasing higher technology. Best practices - Does your hearing care provider follow best practices? If you aren’t receiving real ear measurement testing, you probably won’t get the most out of your hearing aids, even if they are top-of-the-line! Looking to understand the available hearing aid features? Check out Hearing Tracker’s hearing aid matching engine. We recently conducted a survey – with the help of the Hearing Loss Association of America – to learn more about the cost of hearing aids in the United States. Our survey showed that the overall average price paid for a single hearing aid was $2372. For a breakdown of hearing aid prices by brand, please read more on our page about the cost of hearing aids. Looking to pay for hearing aids with healthcare insurance? Medical insurance coverage is available for some consumers. Results for the survey can be found in the infographic below. 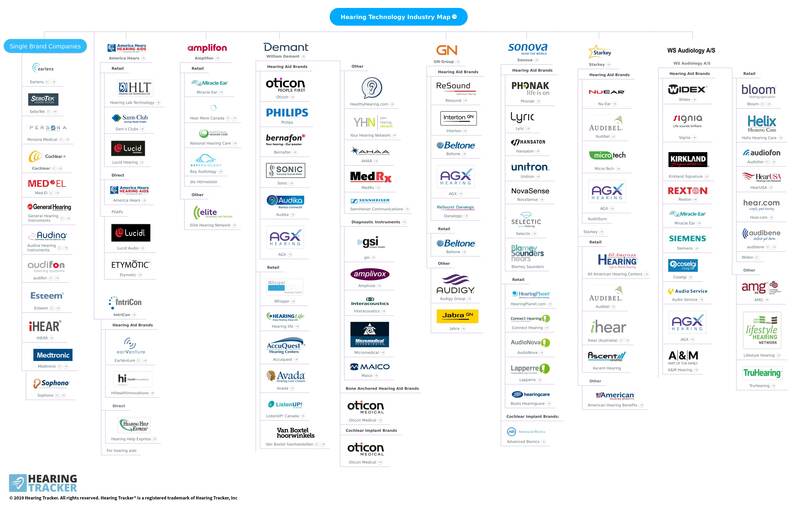 If you are looking for our popular "Hearing Technology Industry Map" keep scrolling past the survey results. Click on the image above for a larger version of the map. How did we make this infographic? We used information available on the web, including investor reports, but also received a number of tips from industry insiders. Please let us know if you see any inaccuracies and feel free to use the commenting system at the bottom of this page to suggest corrections and updates! Disclaimer: The brand map depicted in the image above reflect our best educated guesses as to associations between companies, brands, etc. Linkages do not always indicate full ownership of brand x by company y. Any corrections may be suggested using the inline commenting system or by contacting info@hearingtracker.com. Dr Cliff AuD rings in the new year with his top 7 hearing aids picks for 2019. Keep in mind that you may or may not be a candidate for the hearing aids he discusses in the video. Consult a professional to determine your eligibility for any of the devices discussed! Don’t have time to watch this video either? In 2018, we saw some amazing new technology hit the market, with more technological advancements already in the works for 2019. All of these new devices were designed to provide better sound quality and better speech understanding in background noise, so let’s focus more on the specific features that set these devices apart from the competition. The Marvel is the closest thing that you will find to an all-In-one device, because it basically does everything. It is the only device to stream audio directly from Android AND iOS devices (no accessory required). And, the new AutoSense 3.0 allows the hearing aid to make better adjustments on its own without the user having to make manual adjustments. The Marvels are also Roger-Ready. This means that your hearing care provider can do a firmware update to make the already-installed internal Roger Receiver active so you can use any of the great Phonak Roger FM accessories. And, later this year, Phonak will release telecoil versions of the Marvel in 312, 13, and rechargeable battery models. . The Quattro replaces the LiNX 3D line of devices. Along with its long-lasting lithium ion rechargeable batteries, it will also have the capability of streaming from Android devices, not just iOS devices. It also has the best smartphone app in the industry. It allows you to make all kinds of adjustments to your program settings and even allows you to receive remote adjustments from your hearing care professional. Oticon’s next generation Opn hearing aids feature dramatically improved feedback cancelling along with a new OpenSound Booster in the Oticon On App. Users will be able to use their iPhone or Android smartphones to boost hearing support in their hearing aids when they feel they need it. OPN Sound Navigator allows you to hear speech from different directions while still suppressing background noise. This is different than the traditional directional-microphone strategy for improving speech in background noise. Combine this feature with decreased listening effort and good reported sound quality, and the Oticon OPN S is one of the best hearing aids that money can buy. Note: Dr Cliff recommended the previous generation Oticon Opn in his video, but we’ve updated this section to reflect the recently released technology. The Virto B-Titanium is the only Invisible In Canal (IIC) hearing aid to make the list. As the name suggests, it is made out of Titanium so it can be 30% thinner and smaller than an acrylic hearing aid. Not only is it extremely discrete, it is the best performing IIC hearing aid on the market. It does require a deep ear mold impression, and is not suited for extremely severe cases of hearing loss. This hearing aid has Artificial Intelligence right in the name. This is because it uses on-board sensors to track both body movement and social interaction. It is designed to help you become more physically and socially active, which we know can improve health outcomes. It is packed with a bunch of features such as fall detection and real-time language translation. It now also has the capability of working with remote accessories such as a TV streamer and remote microphone, which can improve your listening experience even more. Evoke made the list because of its use of machine learning technology. Evoke can learn your preferences by allowing you to make A/B comparisons in real listening environments. Tell the Evoke app if you prefer Sound A or Sound B, and your feedback is used to personalize the sound of the Evoke hearing aids. This leads to improved sound quality and greater listening comfort across a variety of listening environments. In addition, Evoke is able to automatically adjust to a variety of challenging listening environments and applies two different compression strategies to improve speech clarity in noisy listening situations. Moxi all made the list thanks to FLEX:UPGRADE. The Flex Upgrade lets you purchase a lower level of technology and upgrade it to a higher level of technology at a later date. You keep the same physical devices, you just have the technology inside of the devices upgraded. This way you can upgrade to new technology when you need it (and when you can afford it), even if it is years down the road. In my opinion, those are the best hearing aids of 2019. Which one is right for you? This depends on your wants and needs, and how familiar your hearing care provider is with each type. No matter how great a hearing aid is, it will not perform its best unless you’ve had real ear measurement performed on them. If you don’t know what real ear measurement is, I highly recommend you check out my REM video because it is the only way to ensure that your hearing aids are programmed correctly to your hearing loss prescription. This is a very easy to understand and informative breakdown of consumer trends. Thank you! This is a great summary Abram. I hope that the next round will break down custom products, Lyric (the only extended wear solution) and surgical options such as Esteem. The numbers may be smaller but the information would be valuable to consumers. I'd never even heard of the Esteem implanted hearing aid till you mentioned it right here, right now! Having almost profound sensoneural hearing loss myself AND daydreaming about aids that I could wear 24x7, in the shower, swimming, water sports - well it would be a dream come true! I hope someone starts a thread on the topic on the board. Seems odd to leave out Signia NX. Some have spoken well of them and it just seems strange to single out Sivantos by not including one of their hearing aids. Abram Bailey 04 January 2019 Replied to Mark B.
I agree Mark. The Signia Pure Nx Charge&Go is a worthy product for this list. I've used one or another of the hearing aids you recommend over the last 15 years. They all ******. THEN I tried a NEW ONE from BOSE called a HearPhone. Amazing! 10 times better than any hearing aid I used before and just $500 and you don't need an audiologist. Battery recharges overnight. Go to a Bose Store and give it a try. You'll probably be blown away with their "aid". You can also buy it from Amazon and check out the customer comments. Curious. Did you use any of the models recommended by Cliff? They were all released within the last year or two. Also, Cliff did a great Hearphones review. Check it out. I agree with both you and Abram. I've been using Starkey Halo since they came out, and currently have the Phonak Marvels on order. I hope to have them soon. In the meanwhile, I purchased the Bose Hearphones, and found them SO MUCH BETTER than my Starkey Halos, that they became my everyday "go-to" aids, even with the annoying and funky YOKE around my neck. I liked them so much, that I purchased a second pair so that I can wear one while the other charges. I have great hope for the Phonak Marvels, and plan to post what I think after I receive them and have a little time to evaluate. Bose Hearphones are NOT hearing aids. They are conversation-enhancing HEADPHONES. They do not, can not, and will not ever say they are hearing aid producers. This is very bad advice to be giving people! How many audiologists were surveyed and how many responded? The results from Q3 2018 were from 411 audiologists (and HIS). Q4 is a larger sample of 500, and we are expecting that data to be available within a week or two. This article will be updated with the new data. The responses above are inclusive of the entire sample. If so, LOTS of survey bias, since hearing people think WAY differently about hearing aids than do deaf/hh people. Good survey would disclose who is surveyed, how many surveyed, how many responses received per question...there are books written about how to create and conduct scientifically valid surveys. The survey was of audiologists and hearing instrument specialists. UBS designed the survey and is satisfied that the sample reflects an adequate representative sample of the dispensing market. Having said that, please do be conservative in digesting the data. I have said in the past many times that this survey is more a reflection of market share by the big brands than anything else... but if it was market share alone, you would always have the same brands on top of every category rating... so there is certainly something more going on there. Unfortunately, I can't share much more than that. More detail is available to institutional investors who has access to UBS Evidence Lab data. I'm another HA wearer and forum participant, not an audi. There is no way to objectively rate hearing aids based on a survey of any group of people. Whether users or audiologists, we can only rate what we've experienced, as consumers or vendors. None of us has tried everything out there. And there can be all kinds of reasons that one person's opinion about a brand or model is subjective. It goes with the territory. My suggestion is to take *all opinions* with a grain of salt, but nonetheless, listen/read. The audiologist perspective can be revealing, as can the customer's, and there are plenty of opportunities to get customer reaction on hearingtracker.com. Maybe you find a brand that's worth a try that you hadn't considered. I appreciate Dr. Abram Bailey's diligent efforts to make information about hearing aids freely available on his website. It's not wrong to question the survey. But it's not right to not see value in it and appreciate the effort. The survey would benefit from additional commentary about audiologists' perceptions of the questions vs. deaf/hh people's perceptions. For example, ease of use is not the same to either group. Ease of adjustment -- hmp!! We're forced to see audiologists for adjustments. I would think it would be very difficult for hearing aid users to answer the questions. It would require them to have knowledge of multiple hearing aids within a short period of time. I dont know anyone who has worn all the brands within the last year, so how could they possibly compare? I agree that a survey of audiologists is pretty useless to HA wearer’s. Audiologists have a huge financial interest in the products they sell so of couse the products on their shelves will be ranked highly. A survey of HA wearer’s is almost as useless as even the most seasoned user has probably only had 3-4 different makes over the past 20 years. And you cant compare a model from today to one 29 years ago. Plus the old “you don’t know what your missing if you’ve never had it” comes into play as well. One that hasn’t heard birds chirping for 20 years will be impressed when Brand A hearing aid lets them hear the birds for the first time but Brand B actually amplifies the birds even louder and clearer. Bit if one never tried B over A the survey respondent would rate Brand A higher than B. With all due respect as an audiologist I can assure you most of us have no financial interest in any manufacturer and do not have a “shelf” full of hearing aids. Most of us order each hearing aid for each individual patient based on their needs and at least I myself have no bias towards any particular brand. My best interest is my patient’s whose success i consider my success. Where is your practice? I am tired of the high pressure sells pitch to buy a type of aid i dont want for $6200! You have to consider the fact that the specialist or audiologist that you saw is looking out for the best interest and best hearing care for YOU. If you don't believe that, and not because you want cheap hearing aids, then you need to find a better provider, but I can tell you from experience that almost all hearing aid companies that are good will be close to the same price for their technology. $6200 would be a mid-top of the line hearing aid, but that may not always be necessary. TALK to your provider. Most people get frazzled at the price and decide to go somewhere else, complain, and then they are sold a bottom of the line hearing aid from the new company. These providers take time with you, it is ridiculous when someone goes to one place and doesn't talk to the provider, but instead decides to go complain elsewhere. Communication is key. Thank you Abram. As anything, read results and look for any gold nuggets that may apply to you. Thanks for making this available to us member of this forum. Are there any superpower aids that are suitable/or can anyone suggest, for a long term analogue user with a severe-profound sensorineural loss (across all frequencies)? Am considering the Signia Motion 3px SP or the new Unitron Max that is due for release early 2019 with Classic mode (minimal sound processing, linear type set up) for people like myself. Would be very interested to hear from anyone else who has struggled to go from analogue to digital. Also, my Audi believes I need an aid with adjustable knee points for compression as I get a lot of speech warble in my Unitron Max E SP, this improved once feedback canceller and all other 'features' were switched off, however it is still quite tinny/robotic sounding and I am absolutely struggling with speech clarity. As an audiologist, one needs to be aware that the vast majority of clinics are owned by manufacturers. Guess which brand those clinician's are going to be selling ( vs their competitors) and guess which brand they are going to favor?? Sorry, but this survey of manufacturer owned clinic owners' is very biased!! Abram Bailey 05 January 2019 Replied to Deb M.
Yes, unfortunately vertical integration has led to a diminishing number of autonomous practitioners. I dont see any of bernafon products at any of your classifications ...although it has the same quality of oticon ..do you have a reason for that ? Has there been that much advancement of hearing aids over the last 3 or so years? While I am intrigued by the Android integration of the Phonac Marvel and it's streaming capabilities would there be much of a quality difference with my Oticon Alta2 Pro Ti aids? They work fine except in really noisey situations. I know fitting is really important. Thanks from Garland Texas. Kind of confused. Does Rexton warrant not even a mention here? Member 03 March 2019 Replied to Mike I.
I am curious about why Rexton does not show up here, too. Costo's Kirkland hearing aids are Rexton and I know they sell a lot of them. Despair! Barely a mention here of MUSIC. The audiogram on the home page says it all - 250 to 8k. Never mind Bluetooth: at a live concert, not wired up like some Droid, we endure a rotten low end, bent and warbling pitch because of anti-feedback. Eventually we Google up enough knowledge to tactfully 'nudge' our audiologist into activating Music option, taking away the pitch scramble, reducing the ruinous compression. In UK, the National Institute for Clinical Excellence as well as audiologist-training colleges are still cruelly unaware of MUSICAL needs - recreational and occupational. What people fail to understand is that for good hearing technology, you are going to spend at least a couple thousand dollars. You do not get good hearing quality and quality of life from $20 amplifiers that you buy at the grocery store, or, depending on your loss of course, from $500.00 hearing aids that an audiologist or specialist just wants to sell you. You will find quality hearing aids more in the $4000 range (for the pair) and while this is expensive, it is so, so worth it. It is comical when someone thinks they are getting good quality from Costco brand over an actual brand such as Phonak, Oticon, or Starkey. Also, I know Starkey is the maker, but Audibel is an exceptional brand, too. I am not sure why they did not make the list.